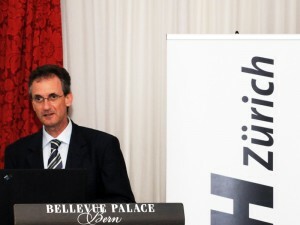 The president of ETH Zurich, Prof. Ralph Eichler invited last Wednesday, June 16 the Swiss parliamentarian to join over lunch to an introduction of ETH Zurcih activities in High Performance Computing. Prof. Thomas Schulthess presented the activities of CSCS and the different elements of the Swiss National Supercomputing strategy (HPCN). Dr. Peter Binder of MeteoSwiss explained why supercomputer are essential for meteorology (CSCS is running two supercomputers for MeteoSwiss for 72 hours weather forecasts). Dr. Alessandro Curioni of IBM Rüschlikon explained how fast HPC is developing and that it is essential to regularly invest in new HPC systems. A short movie (in Italian, German and French) explaining the importance of HPC for science, industry and society has been especially been produced for this day.